It’s a great week for content for us at Hasseman Marketing! We have a great group of diverse content that has been very popular…so now is a great time to catch up! Let’s Start with Delivering Marketing Joy! On this week’s episode we talk with Ray Jimenez from PWS. Ray is a Rising Star in the Promotional Products industry and is a customer service evangelist! Check out this episode here! Oh…and don’t forget to subscribe to the channel while you are there! 3 Mistakes When Shooting Video: So you know you should be doing some video marketing, but don’t know where to start. We get it. So our man Dustin Haywood gives you three things to avoid (and/or fix) in Video Marketing. Where Do You Spend Your Money: At Hasseman Marketing, we are always telling you that business is still about relationships (because it is). In this Medium post, Jeff Wickerham reminds us and tells us why he spends his money here he does. Weekly Word: This week Kirby reminds us that a good sales life is much more about Farming than Hunting. Are you out there planting seeds? Check out the Weekly Word here! 6 Quick Social Media Tips: If you have a new team member and you want to give them some insight on the Do’s and Don’t’s of Social Media, this might be a great place to start. Oh…and if you want a refresher, you should read it too! Building Your Business on Purpose: So many of us bear the cross that is “busy.” But in this LinkedIn post, Kirby Hasseman reminds us we need to be intentional. And when growing your business, you can also have a mission…and that helps too! Read more here. Oh, and share with anyone you think might need to read it! 🙂 The Early Hustle: If you have ever started something, you know the early work is what sets the foundation. But it is often the hard work that is not glamorous. Are you willing to do it? Read more here. First VLOG: We also had some fun with our first ever VLOG. What is that you might ask? Find out here and subscribe to the channel! 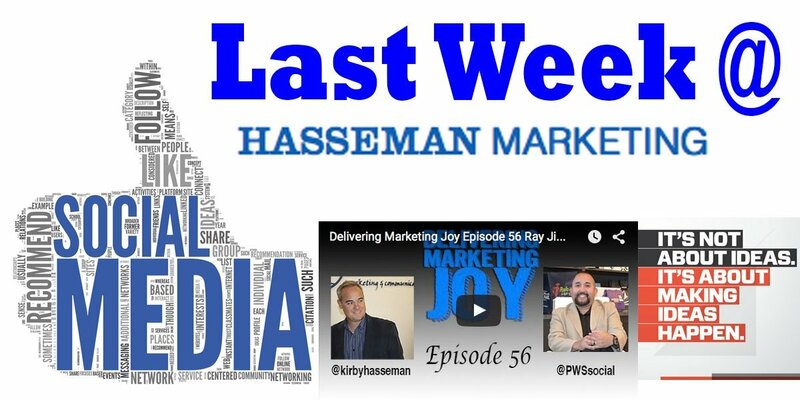 So that wraps up just one week of content here at Hasseman Marketing! It’s a lot to keep up with for sure. But if you want to make sure you never miss a beat, sign up for our VIP LIST here. We want to help you grow! Stop Blaming “They.” It’s Up To You. Join Thousands of Others Receiving Awesome Content from the Hasseman Marketing Team! No worries...we would not sell, share or give out your contact information. That's not how we roll!